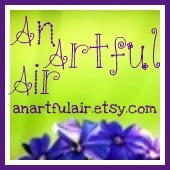 An Artful Air specializes in handmade gifts for all the girls in your life. 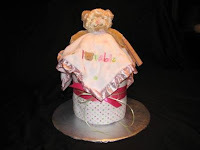 Diaper cakes and gifts for bouncing bundles of joy, handmade tutus from size six months to adult, gifts for little girls and teens, bridal shower gifts, home decor, wine glass charms and more. They even customize & personalize gifts! Kirsten & Becky make up the dynamic duo that is "An Artful Air". Their Etsy shop provides gifts for ladies of all ages. Tutus, fairy wands, jewelry boxes, picture frames, baby shower gifts & diaper cakes, wine glass charms, bridesmaid gifts and more are designed with love for all the special girls in your life. CONTENTS: The diaper cake includes 50 size 1 diapers, 14 size 2 diapers, one full-size baby lotion, two travel-size baby shampoo, a pacifier clip, a pink receiving blanket, a pink infant bow, a pink sequined headband with flower and an elephant washcloth. 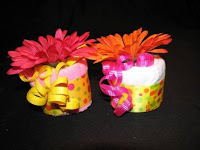 The nine cupcakes each have one diaper and one infant washcloth and are finished off with brightly colored ribbons and sweet flower. Talk about talented! Needless to say, it went over very, very well. I am awestruck by the creativity of these women! I could not be more thrilled! 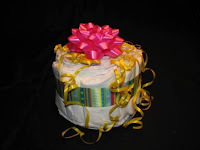 *an artful air provided me a diaper cake & cupcakes free of charge in exchange for an honest, helpful review. no money exchanged hands & these opinions are my own. 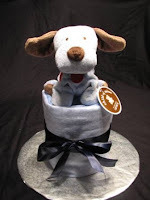 I think diaper cakes are so cute! I kinda wish I was given one. I actually wasn't given any diapers. LOL. New follower from Tuesday Blog Hop. Wish my kiddo's were small again! Cute bear on the motorcycle :) Stopping by to follow on this fine Tuesday - hope you can visit my place and return the favor soon. 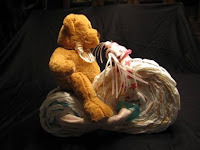 Following from Sweep Tight's blog hop! I really like that glass block. 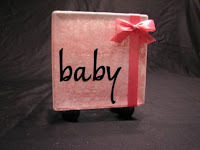 You could use that as a personalized gift for lots of occasions, not just infants.